It’s Adult Summer Reading Time! 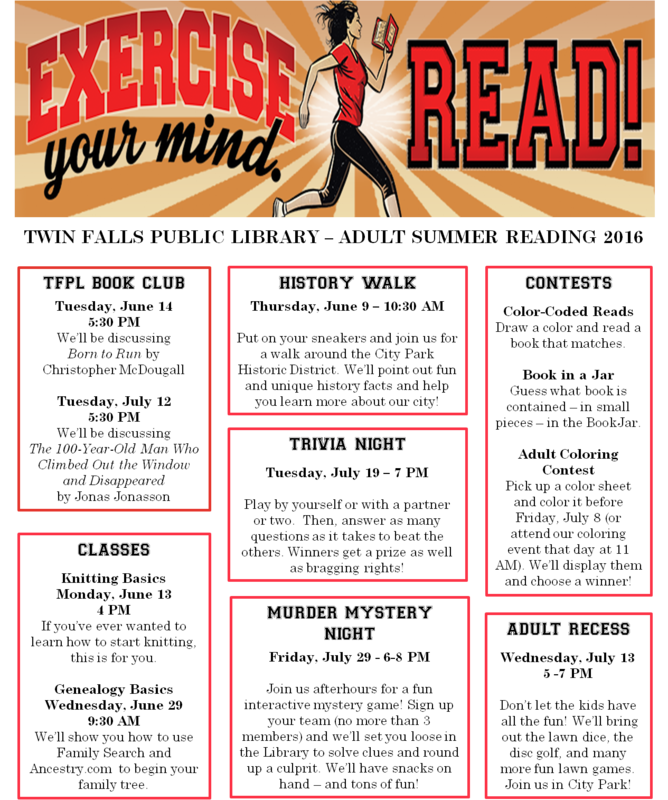 This year’s theme is “Exercise Your Mind: Read!” so we’ve got all sorts of great activities and reading challenges to get adults moving and improving. From walking to reading to playing, we’ve got something fun whatever your interest – and you might even win a prize doing it! First, download or pick up a MEDAL COUNTS CHART from the Library. The brochure lists several reading activities, and every activity completed will earn you a ticket (some are worth two or three tickets!). We’ll draw 8 WEEKLY PRIZES and then 1 GRAND PRIZE winner from all the tickets accumulated during Summer Reading. Additionally, some activities – like our Color Coded Contest or Trivia Night – have their own prize drawings. Do as many activities as you like, and do them in any order. Just get your tickets in before Saturday, July 30 for a chance at our GRAND PRIZE – a Samsung Tablet. And, if that’s not enough, we’ve got some fun events planned. See a Reference Librarian for additional information, or call us at 733-2964 ext 200. And give your mind (and not your wallet) as much exercise as it can handle this Summer! Though we realize it’s probably a little late in the school year (this upcoming Thursday is the last day for schools here in Twin Falls), we thought we’d highlight a great state resource. You can always bookmark it so that next year, when your student is looking for Idaho stuff, you can find it easily. The Idaho Commission for Libraries offers Idaho Resources through its digital resource site, lili.org. This site includes government resources for citizens, access to cool collections like historical photographs, and a link to Idaho Public Television’s online video collection. There is also a tour of the State house and links to documents produced by state agencies. Spend some time looking around the Site and we’re sure you’ll find something you can get excited about! When Gavin Guile, known as the Prism – high priest and emperor – discovers he has a son, born after the war that put him in power, he must decide how much he’s willing to pay to protect a secret that could destroy his world. Two millennia after humans were freed from slavery, the Briar King, a legendary portent of death, reawakens, and the fate of the kingdom lies in the hands of the king’s woodsman, a rebellious girl, and a new-made knight. Simon, a young magician’s apprentice, finds his dreams of great deeds and heroic wars becoming an all too shocking reality in a terrifying civil war. The tale of the bestial Trollocs, the witch Moiraine, and three boys, one of whom is fated to become the Dragon–the World’s only hope and the sure means of its destruction. Pug, a sorcerer, searches for the meaning of a prophetic nightmare that portends the destruction of the world of Midkemia, while two young brothers, untrained and unprepared, become a part of the Conclave of Shadows. FitzChivalry Farseer emerges from seclusion when Prince Dutiful, the young heir to the Farseer throne, disappears. As Fitz sets out to find the Prince before his betrothal ceremony, he is unexpectedly confronted by betrayal and intrigue. The story of an ambitious wizard who, in his fortress in the ancient forest, creates a young warrior and sends him to the new kingdom to renew a long-forgotten war. When the last of the free cities of the Malazan Empire is targeted by the forces of the Empress Laseen, Bridgeburner squad leader Sergeant Whiskeyjack and the mage Tattersall confront dark gods to protect the citadel of Darujhistan. Sir Durendal, the finest swordsmen in the magical land of Chivial, embarks on a quest for a glorious treasure that lies behind the walls of an ancient, isolated, but dangerous city. The sudden death of the Duke of Bari leads to international conflict as the nation of Algarve seeks to annex his country, while the nations surrounding Algarve strive to prevent it. The gods of legend rise again on the world of Amyrantha in this tale of court intrigue, human-animal half-breeds, and claims of immortality. The Deryni, mentalists who served as advisers to the human rulers of Gwynedd, must now contend with the rise of Donal Haldane to the throne, who expects the Deryni to obey his demands. Set in a fantastic city pulsing with the lives of decadent nobles and daring thieves, here is a story of adventure, loyalty, and survival. Kvothe, now living under an assumed name as the humble proprietor of an inn, recounts his transformation from a magically gifted young man into the most notorious wizard, musician, thief, and assassin in his world. Princess Kelsea has been hiding in the forests of the Tearling, training for the role she will have to play when she turns 19 and becomes the queen. But once Kelsea arrives in the capital and proves her right to the throne, her troubles begin. Bridget Lederle is transported to the fantastical world of Isavalta, where she becomes an unwitting player in a lethal game of magic and politics and discovers that she possesses her own unusual powers. The sole weapon against the supposedly dead Warlock Lord, who is plotting to destroy everything in his wake, is the Sword of Shannara, which can be used only by a true heir of Shannara. Though the kingdom of Francia has purged its magi, an orphaned street waif with the gift of song infused within her crafts herself into a weapon aimed to avenge her father’s death. Introduces the world of Roshar through the experiences of a war-weary royal compelled by visions, a highborn youth condemned to military slavery and a woman who would save her impoverished house. Annotations courtesy of NoveList Plus. Log in to Novelist Plus (with your TFPL card) for more information about books, authors, and more! Later this month, TFPL (along with our other LYNX consortium libraries) will be migrating to an entirely new catalog system. All of our records – for items as well as for patrons – will be switched over, and that basically involves pausing all of our processing in one system so we can move everything to the new one. Starting Thursday, May 19, we’ll enter what we’re jokingly calling “Dead Week” – a week in which you won’t be able to place holds or pay fines, but you will still be able to check items in and out. This will last (fingers crossed!) until Wednesday, May 25 when we go live with our new ILS. Because of this change, the catalog links to our blog posts prior to this one will be considered lost links. Sorry! We may not be able to restore all those links in the near future, but the information is still relevant. This also means we won’t be posting catalog links until after May 25, but look for even more fun reading suggestions after that date. We’re excited to see what the new system has to offer!